Every every Space Station advertises a number of ever-changing Contracts. Some offer rewards for completing a certain task: others offer goods or land at a price. You can accept as many contracts at one time as you like: all currently active contracts will appear at the bottom left of your screen. As you complete contracts, they will disappear from that list. There is also a Space station at Star System 'Jam-1' accessible via the map, and jumping to it when you have advanced enough to have a Hyperdrive. Space Station 'Deep Six' at Jam-1 currently only has the 'Contracts Board' with prices somewhat higher than the base 8 systems due to it's remoteness and lack of visitors. New contracts become available three times an hour. Top of the hour (:00), quarter after the hour (:15), and three-quarters after the hour (:45). Deliver passengers to space station destinations to receive a cash reward. Your space craft can only hold a certain amount of passengers, and space must be available in order to accept the contract. Bigger ships hold more people, and make you more money. Accept a package delivery and you will receive a reward when you arrive at the destination. Packages do not use up your regular hold space, so accept as many contracts of this type as you like. These are contracts requesting a specific product at a specific price. They can still be accepted if you don't currently have the goods: when you return to the same space station with the requested product, you will receive the reward. These contracts offer an alternative to trading through the Market, and can fetch a much higher price. And unlike the market, the price won't fluctuate: so if you see a good price offered, you can accept the contract and return at your leisure. There are several rare materials in the game that can't be purchased at the market or mined/farmed on planets: Farming Robots, Mining Robots, Hydrogen, Oxygen, Silicon, Magnesium, Niobium, Tin and Uranium. There are contracts offering some of these items for sale, and contracts offering to purchase. Some items can be manufactured on your Space Station (Farming and Mining robots). Some Obtained by skimming the surface of gas planets (Hydrogen and oxygen). Some obtained by Mining Asteroids (Silicon, Magnesium, Niobium, Tin and Uranium). Depending on the contract, you can often sell these items at a much higher price than you buy them, so can be a great way to turn over some quick cash. Each contract varies in amount for sale or purchase, and will use up space in your hold. You don't need to currently have the cash to buy or goods to sell to accept the contract: just return when you can fulfil. Before you can settle on a planet, you need to purchase a land deed. You don't have to currently have the money to accept the contract, so if you see a good offer it can pay to accept it. After returning from deep 6 to ceres for the quest, you will receive a class 1 hyperdrive blueprint. To build your settlement, you must purchase a blueprint for 13 of the 14 available building types. You can only get the Grain Farm blueprint through the tutorials. 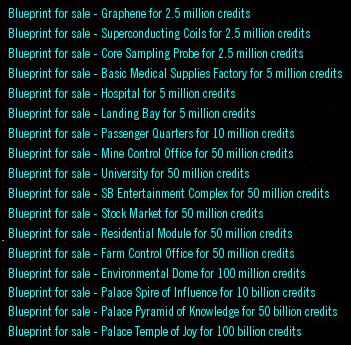 You only need to buy the blueprint once, then you can build as many of that building type as you like on any planet you own a land deed for. You do not need to have to have the money to accept the contract, you can accept a good price and pay for it later. Ship module blueprints can be obtained in Janus A (some require completing the first two combat missions) and at Deep-6 after completing the tutorial. Many blueprints do not show up unless the player has enough credits to purchase them. The gate part Blueprints, class 12 wormhole generator and class 12 promethium capacitor, do not show until after the seraph blueprint is purchased. Note: The Blueprints sold for Core Sampling Probes, Graphene and Superconducting Coils are for the specific parts which are then producible at your Shipyard. Purchasing one of said Blueprints also unlocks the ability to research the respective Space Station Factory Module at your Research Lab. Note: The Class 12 Wormhole Generator blueprint is given as a reward during the execution of the Neptune Project missions. The Light blueprint was a Christmas 2014 gift given to active paying players. There is no other method to obtain this blueprint. This page was last modified on 30 January 2018, at 14:21. This page has been accessed 51,920 times.